Appam | My Cooking Diaries "CooklikeCecilia.com"
Wash rice and poha and soak for 4 to 6 hours. Drain and grind alongwith the coconut milk and cooked rice to a fine paste. Add 2 tbsp. warm water and 1 tsp. sugar to the yeast and leave for 10 minutes. Add the yeast to the rice paste, mix well and leave to ferment for 6 to 8 hours or overnight. When fermented, add salt and sugar, stir well. Add coconut milk or water if the batter is too thick. Batter should be little thicker than pancake batter. Heat an appam griddle, pour ½ cup batter and gently swirl the pan to make 2” diameter appams. Cover and cook on very low flame till done. Avoid browning the appams. 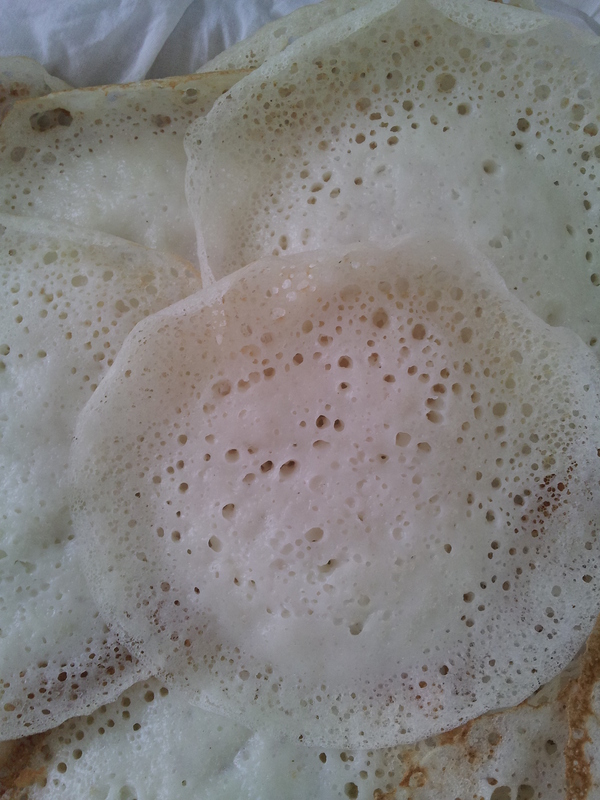 The center of the appam should be thick and spongy and the sides should be thin.